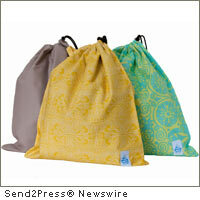 DENVER, Colo., May 9, 2011 (SEND2PRESS NEWSWIRE) — Recycle Fashionably announced this week that Bikram Yoga Calgary is its 50th retailer to carry the environmentally friendly, and oh so fashionable Sweat Mate – a reusable, waterproof bag. The Sweat Mate comes in an array of colors and patterns for men and women. For example, Pressed Leaves, Wallflower, and Wildwood are just a few of the inspiring choices offered. Options will vary based on designer fabric availability. Sizes range from small to large and the reusable bags are designed for just about any activity – indoors or outdoors. Retail prices are: $20, $25, and $30 and Recycle Fashionably welcomes wholesale accounts too. The exterior of the bags are attractive and fun. Designer cotton fabrics are used for the exterior. The lining is comprised of urethane-coated rip-stop nylon; and the drawstring is a heavy-duty nylon parachute cord. The Sweat Mate is ideal for any fitness-related activity. It keeps wet and sweaty items from invading the rest of the gym bag. It also makes the perfect companion for moms who need a quick place to stash those last-minute baby messes. For more information visit: www.RecycleFashionably.com . Recycle Fashionably was started with one mission in mind: to keep plastic bags out of landfills. The company stands firmly behind reusing, reducing, repurposing and recycling. Its reusable bags are manufactured in Denver, CO and U.S.-made supplies are utilized when possible. Despite less expensive competition, supporting the local economy remains a key component of its business strategy. Currently, plans are in the works for more expansion into gyms, dance studios and other fitness arenas. New and exciting color options and a backpack version of The Sweat Mate are also coming soon. Original Keywords: Aurora Sisneros, Recycle Fashionably, Sweat Mate, Bikram Yoga Calgary, Designer cotton fabrics, gym bag, reusing, reducing, repurposing and recycling, urethane-coated rip-stop nylon, green products, made in usa, Denver Colorad business news, retail, reusable bags Recycle Fashionably Denver Colorado DENVER, Colo.
REFERENCES: Business News, Aurora Sisneros, Recycle Fashionably, Sweat Mate, Bikram Yoga Calgary, Designer cotton fabrics, gym bag, reusing, reducing, repurposing and recycling, urethane-coated rip-stop nylon, green products, made in usa, Denver Colorad business news, retail, reusable bags Recycle Fashionably Denver Colorado DENVER, Colo.